Navaratri or Dasara in Mysuru of ancient period was famous all over the world and visitors used to throng the city to witness the spectacular Durbar held in the Palace. With the advent of changes to suit the democracy, the monarchy has been given up. But persons of my age still vividly remember the glory of Navaratri Durbar of the Maharaja. Navaratri has a hoary antiquity going back to the dim past of Epics and Puranas, which was adopted by the Hindu kings. As on record we have great details of Navaratri from the times of Vijayanagara and particularly of Krishnadevaraya. The foreign visitors who saw the Dasara of that period have described it in great detail and that itself is a subject of separate study. I had the good fortune of visiting the Mysore Palace with a pass in the gallery wearing the prescribed dress. All these thoughts came to my mind while writing this note. However, I confine myself to the study of Navaratri of Goddess. Goddess Chamundeshwari amalgamated the power and prowess from no less than Shiva, Vishnu and Agni for the sake of protecting the good and destroying the wicked. The Gods thought that Devi was the right person and requested her to take up this onerous responsibility of putting down the evil and to strengthen her hands, each one of the Gods gave different powers to her so that she could become successful and achieve the great mission of freeing the world from the tormentors of different types. Thus was born Devi the indomitable energy personified and she vanquished the demons. In this connection, Mahishasura is considered as the wicked demon and it is believed that the name Mysore is derived from Goddess Mahishamardini. 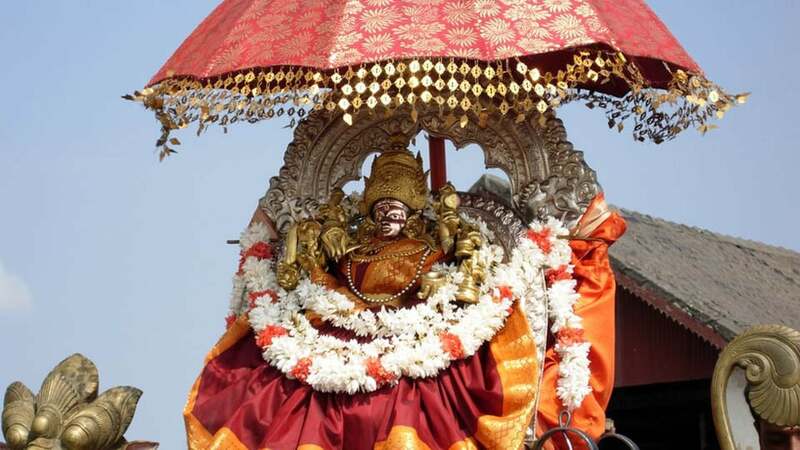 In fact, Chamundi is the prominent form of the Goddess. That is why the Hill is famous as Chamundi Hill. In fact it was originally called Mahabala Hill (Mahabaladri) and the name Chamundi Hill became popular with the Royal family making Her their family deity. According to Puranas, various demons performed penance and got the boon from Shiva or Vishnu that nobody should kill them. After that they began to torment good people. Seeing this the Goddess had to assume multifaceted forms in accomplishing her goal. Thus she is known by various names and forms through which she is worshipped during Navaratri. 1) Mahakali, the vanquisher of demons Madhu-Katabha. 2) Mahishasuramardini, the destroyer of Mahishasura. 3) Chamundi, the killer of Chanda-Munda. 4) Kali, the killer of Raktabija. 5) Raktadanti, the great destroyer. 6) Durga, the harbinger of destruction of Kamsa. 7) Shakambari who warded off the famines. 8) Durgadevi, the destroyer of demon Durga. 9) Brahmani, the killer of demon Aruna. However, there are some variations in different texts. But basically the Goddess is the destroyer of wicked demons. Thus Devi assumed these nine forms to accomplish her onerous task as per the request of the Gods and these various forms are worshipped during the nine days from Padya (the first day) to Navami (ninth day). In course of time, the worship of Saraswathi and Lakshmi was also added to add soft form of the Goddess for worship during Navaratri. Another significant ritual of Navaratri is the exalted position given to unmarried girls (Kannikas) who are supposed to personify the Goddess. Hence Kannikas are invited and worshipped as Kumari, Trimurti Kalyani, Rohini, Chandike, Shambhavi, Durga, Subhadra and Kali. This list varies according to texts. In our tradition it is generally shown that great persons or even mythological personages worshipped different forms of Goddess and achieved great success. Navaratri was first celebrated by the Gods. In course of time it became so popular because success could be achieved against the evil if it is started during this period. Hence, Sri Rama invoked the Goddess and achieved significant victory over Ravana, the personification of evil. Mahabharata also extols the efficacy of the worship of the Goddess. The Pandavas had hidden their weapons under a Shami (Banni) tree and started their Digvijaya (Victory March) after the worship of the Goddess. This practice is in vogue even today. It has to be noted that Goddess was worshipped not for personal gains but for the welfare of the society. This Navaratri is generally referred to as Sharannavaratri (as it occurs in Sharat Kala or autumn) and most of the homes where all these rituals are followed do the parayana (recitation) of Ramayana or Devimahatme for the welfare of the society. This festival is celebrated in Sringeri Sharada Peetham not only at Sringeri but also at Bengaluru and Mysuru Shankara Mutts. In Mysuru Shankara Mutt special pujas are offered to the Goddess and Goddess Sharadamba is given different forms and decorations. Annadana is also arranged during Dasara. Arrangement of dolls at homes is another attraction. Of course, the Wadiyar family celebrates Dasara in private following the ancient tradition. Thus Navaratri or Dasara has been continued from Puranic times to the modern days with suitable changes as required. Instead of the procession of Wadiyar Kings on the Golden Howdah, the idol of Goddess Chamundeshwari is taken in procession and people show their devotion to her. Ultimately, it is a celebration for annihilation of the evil and establishment of the good and moral order (Dushta Shikshana, Shishta Rakshana). In fact, all Hindu festivals are aimed at this noble aim. Let us participate in this festival actively and invoke the blessings of Goddess Chamundeshwari. Our salutations to Goddess Chamundeshwari. The author says that Navaratri or Dasara of ancient period in Mysuru was famous all over the world and visitors from all over the world would visit the City. Could he enlighten us about what ” ancient period” means in this context? It is a nonsensical statement, and I would have seen the logic if he had said about Wodeyar’s period and even before during the British rule or had mentioned what he means by ” ancient period”.